Dora and Boots jump into a book of nursery rhymes to help a little lamb get back to her owner, Mary. Boots calls in truck friends for a rescue mission to help an ice cream truck stuck in the ditch at the Play Park. Dora and Boots help a robot named Roberto who is lost. Benny accidentally turns himself into a potato using a magic wand from a friendly young wizard. Now Dora and Boots must get to the wizard’s castle to reverse the spell. Dora and Boots needs to rescue three friends, but Boots, Baby Jaguar, and Isa panic every time they see something dangerous, so Dora teaches them how to take deep breaths. Dora and Boots gets teleported into a handheld console video game to protect the one hundred pups from being captured by a dog catcher. Dora and Boots set off to tell a Kinkajou Magic words to fulfill his destiny to become a king. Dora and Boots imagine the continuation of fairytales. Boots has a hole in one of his boots. Along the way to the Fix-It Machine, Dora and Boots encounter other friends with things need to repair. Dora, Boots and Diego help a baby dinosaur get back to Dino Island. Dora and Boots wants to play baseball. More than anything, on his Special Day, Boots wants to visit his dad at work. Dora and friends help a baby penguin get back to the South Pole. Dora and Boots blast into outer space to help five space visitors named Flinky, Inky, Pinky, Dinky and Al get back to Purple Planet. Dora and Boots meet a little monster while trick-or-treating. Dora’s cousin Daisy is playing a soccer game. But when Daisy’s team, the Yellow Tigers, has one player less, Daisy counts on Dora to play on her team. Dora and her friends are about to perform a musical play about pirates for audience of friends and relatives. When the Pirate Piggies steal the treasure chest with all the costumes inside, Dora sets out to cross what’s literally the seven seas and pass under Singing Bridge in order to get to Treasure Island and retrieve the costumes. The Big Red Chicken is hosting a Super Silly Fiesta but the cake is missing. Boots needs to find his stuffed dinosaur in time for a sleepover. Dora and Boots try out different jobs. Dora and Boots help Little Red Rooster get to the highest hill to wake up the sun. 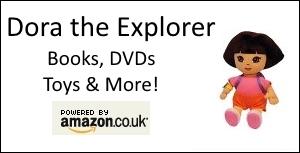 Dora and Boots enter an alphabet book, and except for Armadillo, see all the other animals (from A to Z) are missing.